Today I felt very uncomfortable as I passed out flyers for my workshop. It was weird coming up to strangers explaining to them why I'm giving them a flyer. At that moment, I knew that I was stepping out of my comfort zone. At times, I get nervous about this workshop, but I know if I trust God and lean to him, everything will work out. I know God has blessed me with this idea and is guiding me the whole way through. I only want to be the background and allow him to take lead. I have all types of emotions, but I know one thing for sure is that I am stepping out. Stepping out was a goal for this year, and I am glad and honored that I'm able to achieve it. I'm so excited and can't wait to help women across the globe. Whatever you may be dealing with, don't let fear get in the way. Fear is the trick of the enemy and his plan is to steal, kill, and destroy. We can all achieve our dreams, but please let God take the lead. 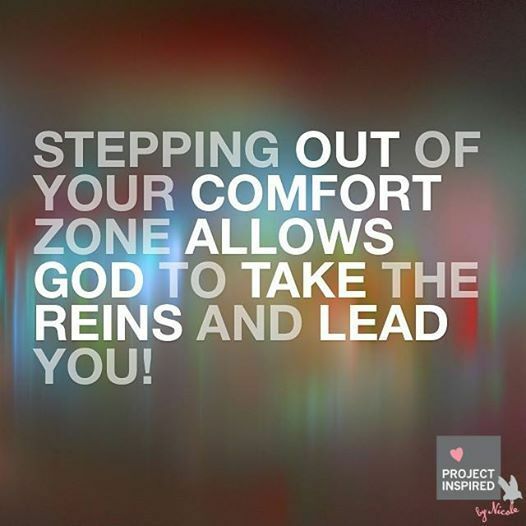 In order for your dreams to come to fruition, you have to step out of your comfort zone. It's going to feel uncomfortable, but I'm here to let you know if I can do it you can too. Here's 3 tips to help you stay focus. Always seek God first because he knows the desires of your heart. Take self out of the equation and let God lead the way. Set a specific day or time to focus on your goals.